Montreal is known for its delicious, but unhealthy, treats from smoked meat, to poutine, bagels and crepes. The diversity of delicious food is what makes Montreal a prime location for gastronomy. But prior to fulfilling that poutine craving, it’s important to consider the affect it has on a healthy body before scarfing it down. Raffi Marayan works at a supplement and vitamin store and encourages people to lead a healthy lifestyle. He said eating out is especially unhealthy for students, who tend to eat inexpensive fast food over pricey, more-nutritious meals. Other variables that affect healthy calorie consumption is your natural metabolic rate, the amount of energy your body needs to carry out daily tasks and the calories needed for performing physical activities like running or lifting weights. “An average female student has three cans of Budweiser, three nights a week. That’s conservatively drinking, but totals 1,300 calories. website Food and Drinks in Montreal, believes eating out is important. Schwartz’s (3895 St. Laurent Blvd.) is Montreal’s most famous smoked meat and steak house. It’s been around for 80 years, which proves it’s worth. Although a smoked meat sandwich with french-fries is high in sodium and cholesterol, a trip to Schwartz’s is a must for anyone visiting or living in Montreal. Another hotspot authentic to Montreal is La Banquise (994 Rachel Est). Open 24 hours, this restaurant has won awards for having the best poutine in Montreal and carries 28 varieties. It’s a great place to get late-night grub. 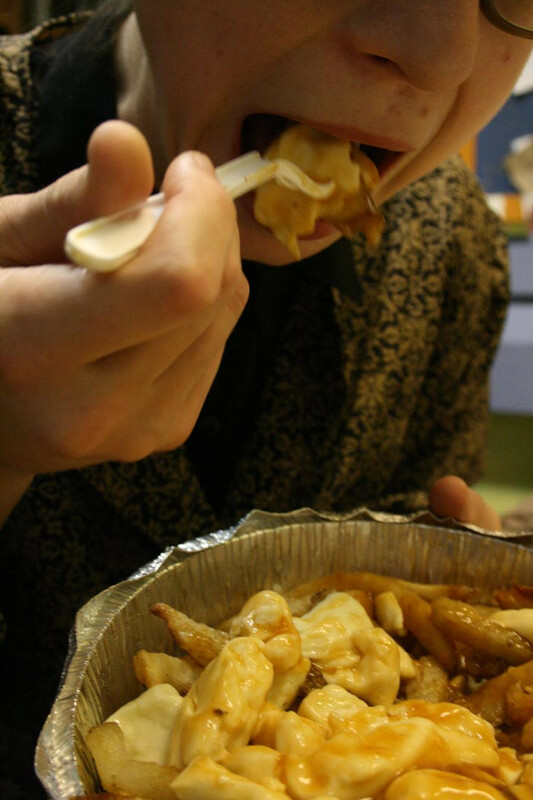 Unfortunately, a small poutine has over 700 calories and is nearly 50 per cent fat. The calories increase when meat or sauce is added to the gravy and cheese curds. However, La Banquise poutine is something everyone should try—perhaps just save it for special occasions. Juliette et Chocolat has three locations in Montreal to visit and indulge in sweet goodness. There are savory items on the menu, but everything else is chocolate based. With thick hot chocolate, alcoholic cocoa drinks, crepes, ice cream and rich brownies, it sounds too good to be true. Although chocolate isn’t the healthiest option, it contains antioxidants and releases endorphins, so a trip to Juliette et Chocolat can easily be justified. Cosmo Snack Bar (5843 Sherbrooke St. W.) is a legendary small diner. From the appearance, you’d never go inside, but after trying the food, you will not want to leave. Perfect for breakfast after a night out, Cosmo opens early every morning and serves omelets, toast, hash browns and more. Everything there is covered in saturated fat, but the flavor is worth every unhealthy bite. For a taste of Montreal’s famous bagels, try St-Viateur Bagel on St. Viateur St. in the Mile-End. Bagels are served 24 hours a day, seven days a week. According to the website, each bagel has 220 calories, which makes them less harmful than regular bagels. With plain, poppy seed or sesame seed bagels, St-Viateur Bagel is a perfect place to grab a breakfast.